Following the events of Pete’s rage and Rick’s execution of the abusive man, the community of Alexandria is left to figure out how to move forward. With Reg and Pete set to be buried, Rick and Deanna agree that Pete does not deserve to be buried within the walls. 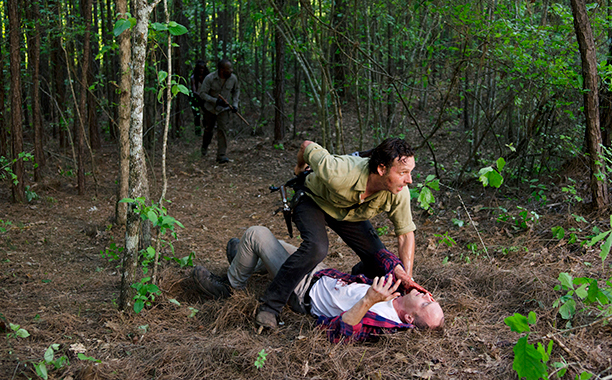 Along with Morgan, Rick sets out to drive Pete’s body away from the community to dispose of it. At that time, they discover a valley full of walkers which is seemingly bursting at the seams. 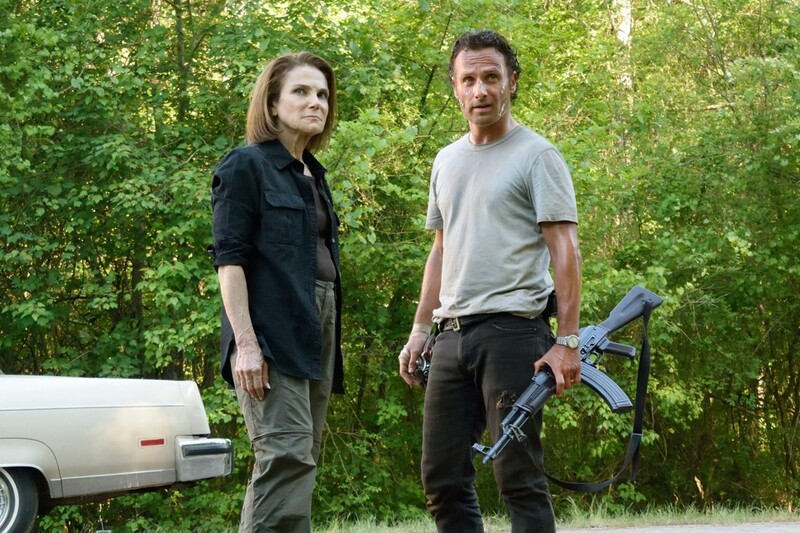 While a group of Alexandrians seem determined to overthrow Rick’s new power with Deanna, they eventually commit to his plan to lead the walkers out of the valley and away from the community. As they work to carry out the plan, not everything runs so smoothly and there is a significant difference seen with the preparedness to fend off the coming danger between Rick’s group and the rest of the townspeople. Division of Leadership: One of the biggest themes of the episode followed the challenges of leading in this mixed community. Rick has a much more heavy-handed approach to leadership, while Deanna has been much more political and diplomatic. The community had been protected and safe (relatively speaking) prior to Rick’s appearance. While the dangers were always there, Rick brought greater awareness to them. Now with Deanna finding it difficult to lead with the same strength she has exhibited to this point, Rick’s presence has been significantly more prominent. With this transition, the townspeople are not too happy about the overall change in tone…but neither are some in Rick’s group. Carol seems to continue to be playing the mole. She remains watchful, which only Morgan seemed to pick up on during the wall construction. In contrast, Morgan and Michonne seem to be affected by how Rick is approaching his newfound power. Morgan was somewhat surprised to find Rick standing over Pete’s body and his attitude about Carter. Michonne already had to put Rick in his place during his crazy phase in the middle of the town. Both of them seem to be wary about the forcefulness with how he is conducting himself. Managing the Grief: There is not much time to grieve in this new world. Rick’s group has already learned this, but Alexandria has not. Deanna clearly needs time to grieve with the way she has bent to every whim of Rick since the incident at the meeting. Jessie seems to be in a similar situation, but likely remains more conflicted because of her husband’s clear display of horrific violence and the counter violence presented by Rick. Unable to know what she should feel, she clearly has decided to distance herself from Rick as much as possible while still managing to hear Rick’s words of caution. Finding Purpose in a Broken World: The dispute between Rick and Daryl about whether to continue to recruiting is an interesting one. For Daryl, he has always seemed to struggle with finding his place. Beth saw that he had been preparing for a world of survival, but he never saw himself fitting in anywhere. With Alexandria, he felt like a caged animal. Allowing him to go outside the walls and find other survivors seemed to be the best opportunity for him to find that purpose, which maybe can be seen as a selfish reason to fit for his role. Still, it seems that Daryl is right. Their community would be stronger if they could continue to find new people to help fight off the harsh world outside. Eugene still has not found his place yet, but he at least seems to have found a general direction. He and Tara have a friendship that gives him someone to truly care about. She immediately appreciated seeing him when she woke up and even commented on his hair game (which he connected later with Heath on). He also felt obligated to try to protect the group when her heard the separatists planning to take down Rick. His true purpose seems to be just out of reach. Moving Forward: With the loud alarm blaring at the end of the episode, it seems like some troubled times ahead for Alexandria. Is the the Wolves or some other threat coming to test the survival of Rick and his community? Also, was anyone else a little sad when Tara mentioned Noah’s names? Hopefully anyone reading this appreciates the new format. To try to get more interaction with my blog, I am now going to ask an opinion question rather than post a poll. Add you answer in the comments below… Also, a review of Fear the Walking Dead will be coming soon. Question of the Week: Do you believe that Jessie will find a way to forgive Rick?